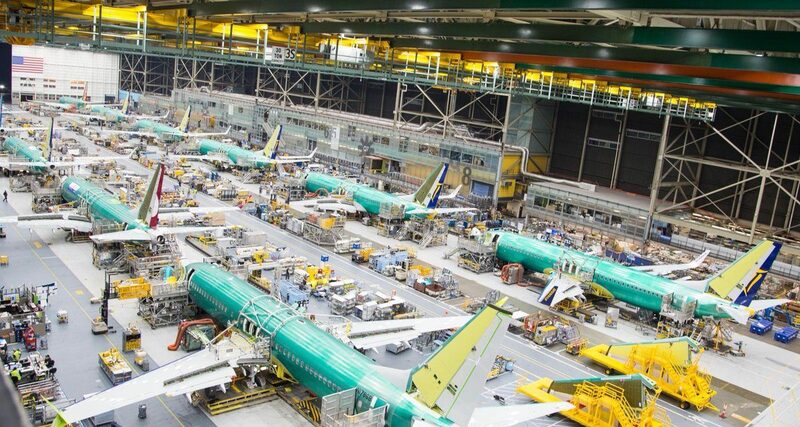 The Supply Chain Matters provides a further update on commercial aircraft manufacturer Boeing’s ongoing efforts to resolve supply network production ramp-up challenges involving the 727 MAX aircraft. Earlier this month, we alerted our blog readers of a report of accumulating unfinished 737 aircraft adjacent and near Boeing’s Seattle production complex. A report published by The Wall Street Journal indicated that Boeing officials were requesting nearby airport officials for added parking spaces to store a growing number of unfinished aircraft, believed to be upwards of 50 aircraft. A Boeing spokesperson indicated to the business media publication that the specific request for added parking space was part of a “recovery plan” to get deliveries to match production rates. The problem concerns late deliveries of completed aircraft engines from supplier CFM International, and certain aircraft part components from Sprit AeroSystems. Up to this point, the most visibly impacted commercial aircraft manufacturer has been Airbus, which over a good part of this year, has had to resort to parking high numbers of mostly assembled A320 neo aircraft on factory runways, awaiting engine manufacturers Pratt & Whitney or CFM International to make good on overdue completed engines. Since our September 5th update, additional information has come forth. Reuters reported that Boeing had initiated actions to callback previously retired aircraft production workers to augment current staffing and work-thru the current logjam. The aerospace manufacturer reached a supplemental agreement with labor unions representing current workers to hire retired mechanics and inspectors. In its report, Reuters indicated that the company had already deployed an additional 600 workers and new hires at the Renton Washington facility in recent weeks. Last week, Boeing formally reported August aircraft deliveries of a total of 48 of 737 family, of which 21 were of the 737 MAX model. That compared with a total of 29 of 737 aircraft delivered in July, of which 11 were the 737 MAX model. Current production planning for the 737 family is pegged at 52 aircraft per month. Boeing’s CEO attended an investor conference last week and indicated a recovery of 737 production is expected by year-end. Industry media also point to transition challenges that occurred when switching from the 737 NG to the MAX production process needs. Spirit AeroSystems indicated the supplier has been making progress on transitioning to higher rates of production and is on-track to meet 2018 delivery targets. Spirit’s CEO indicated at the same investor conference that there was upwards of 1300 parts being planned for either dual-sourcing, multi-sourcing, or in-house production in order to meet Boeing’s 2018 needs. He noted there are a “handful” of remaining major suppliers still working on catch-up this year. In a regulatory filing last week, Spirit acknowledged the need for elevated levels of overtime, additional contractors and added freight charges as a consequence of its recovery planning. CFM continues to acknowledge a four-week gap in meeting expected engine load dates at factory. The engine manufacturer indicated a current combined production cadence of upwards of 30 engines per week, or 120 engines-per-month for the LEAP 1A specified for the Airbus A320 neo and the LEAP 1B for the Boeing 737 MAX, with plans to increase that rate in the coming weeks and months. CFM further acknowledged that the LEAP 1B is till in the early ramp-up period due to the 737 MAX’s later introduction. The current weekly production rate of 14 engines must meet a rate of 20 engines per week by year-end. Our readers know that overall industry and individual manufacturer supply networks will occur glitches and part shortages at the weakest links, often several tiers within the network. For commercial aerospace supply networks, where many key suppliers and corresponding product design and capacity resources are shared, the unprecedented ongoing ramp-up was bound to run into these challenges. Now, they are far more visible, reaching levels of the C-Suite, industry media and in all-important investor forums. As our readers also know, there are always added challenges around the corner, either ongoing engine operational reliability issues, natural disasters that can disrupt the supply network cadence, major trade and tariff changes or changes in airline customer preferences and route plans. The notions of end-to-end supply network visibility, proactive supplier management, multiple sourcing and other resiliency actions are paramount stakes for today’s commercial aerospace supply chains. Individual OEM manufacturer’s efforts to balance the need for airline customer aircraft delivery milestones, short-term investor returns, and investments in supplier capabilities tend to all interact in this dynamic and highly visible industry segment.